A recent National Geographic survey of World Heritage Sites found that Waterton-Glacier International Peace Park and the surrounding region is one of North America’s “great unspoiled places.” The survey rated the area highly for the integrity of its natural and cultural resources: “This region has maintained its distinctive character when many other places haven’t,” according to Jonathan Tourtellot, Director of National Geographic’s Center for Sustainable Destinations. 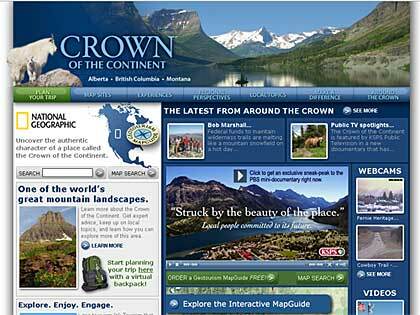 In 2008, the National Geographic Society is introducing a new initiative to showcase and protect the unique ecosystem that is the “Crown of the Continent.” This special project of the Society has created a Mapguide and interactive website to both showcase the special qualities of this place in the Rocky Mountains (covering corners of B.C., Alberta, and Montana) and to encourage a geo-tourism approach to visiting here. The NGS recognizes that it is imperative to protect and preserve those features and qualities that make the region such a desirable place to visit. At the same time,visitors to such treasured locations are asked to educate themselves about how to tread more lightly on the earth. Waterton Lakes Park is a true jewel for the nature lover. Whether you want to stroll along a flat trail to a beautiful waterfall, enjoy an international boat cruise on the main lake golf, mountain bike, explore on horseback, or take on the challenge of the mountain hike rated ‘best in Canada,’ Waterton has something you’ll love!Together with its sister Glacier National Park in Montana, Waterton is the centrepiece of the ‘Crown of the Continent.’ The Parks include the headwaters of three major watersheds, draining into different oceans, which means the area has an unusually rich and varied number of plants and wildlife species. Large predators include wolf, coyote, cougar, grizzly bear, and American black bear. As well, the park’s grasslands are important winter range for elk and deer. In the fall, the marsh and lake areas host migrating ducks, swans, and geese. Each spring, the park hosts its Wild Flower Festival – see www.explorewaterton.ca for specific dates. Home to more wild flower varieties than any other National Park in Canada, the festival presents a riot of colour in the hills. On the last weekend of August, it’s time to party at the annual Beargrass Festival, with the ‘Show and Shine’ classic car show, along with the ‘Taste of Waterton,’ which features a renowned chili cook-off. The park offers a variety of accommodations ranging from historic hotels, elegant inns, and quaint motels, to full service lakeside campgrounds and RV sites or backpack-only wilderness campgrounds. On busy summer weekends, it’s a good idea to make reservations well in advance. A fine way to start and end your day is to drop in to one of the village’s excellent restaurants or cafés. 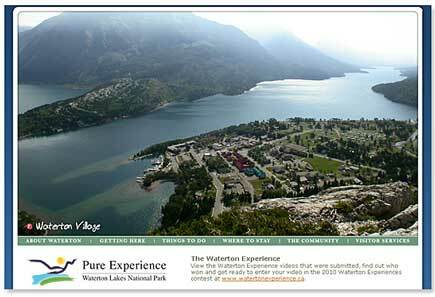 Waterton’s charming village also offers a unique array of clothing, souvenir, fine arts, crafts, and outdoor stores. In spectacular Waterton Park, several different ecological regions meet and interact in one of the narrowest places in the Rocky Mountains. It is here that some of the most ancient mountains in the Rockies abruptly meet the prairie. Waterton is well known for its wide variety of easily accessible lakeside strolls, interpretive loops, high country day hikes, and beautiful ridge walks with breathtaking vistas. 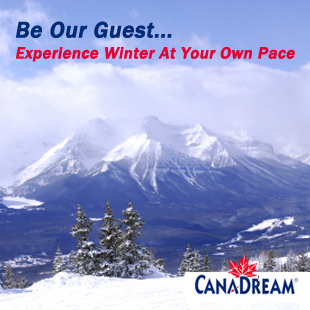 The park has more than 200 kilometres of trails to entice all skill levels. Some hikes are accessed via a ride on the Motor Vessel “International,” such as the famous Crypt Lake hike, which was voted “Best in Canada.” Other water activities include renting canoes and fishing on beautiful Cameron Lake.Easy walks include strolls along the shores of Upper Waterton and Cameron Lakes. A lovely, winding 16-kilometre drive through rolling prairies and past flowery slopes leads to Red Rock Canyon, where a short interpretive trail loops around deeply carved walls of the canyon’s distinctively red and green rock. A nearby interpretive walk traverses through open forest for one kilometre to the impressive plunge of Blakiston Falls. Whatever your fitness level, Waterton has an adventure just for you.